It’s that time of year again. The leaves are starting to fall but the temperatures are still warm, and it doesn’t feel like time to use the fireplace yet. But, as we all know time fly’s, and before you know it you’ll want to be using that fireplace in no time. 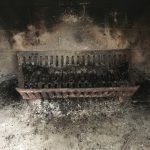 If you haven’t had your fireplace cleaned or inspected in a while it is time to have it done before the mad rush after the first cold snap. Having your fireplace cleaned and inspected regularly ensures safe and efficient operation of your fireplace, wood insert, or wood stove. 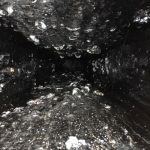 A proper cleaning with the addition of a camera inspection can identify cracks in the flue tiles or issues with the stainless-steel vent piping. Cracks in the flue tiles decrease the structural integrity of the tile and can cause the tile to break apart exposing the inside brick that aren’t made to withstand the high temperature and exhaust gases. This can also cause the brick to heat up and transfer that heat to combustible materials in your home, I.E. rafters, beams etc. Regular cleaning also ensure that soot and debris are removed before highly flammable creosote builds up inside the chimney system. Creosote is classified in stages and in the latter stages can become like black glass and is highly flammable. A regular sweep will not remove this and it takes more aggressive and expensive processes to remove. So, it is important to do preventative maintenance on a regular basis!